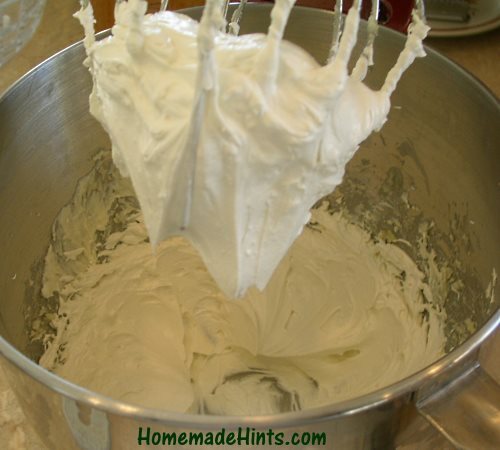 Making your own whipped body butter is fairly simple. The best part it’s completely natural and free of the toxic ingredients found in most conventional lotions such as phthalates, parabens, sulfates, propylene glycol, alkyloamides, diethanolamine (DEA), synthetic chemical fragrances, etc..
How much body butter does this make? 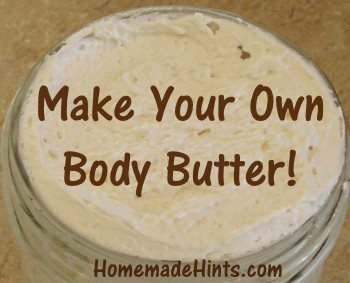 This recipe makes about 8 ounces of body butter. You can always double it to make more in the future. I suggest you try this amount first to determine if you like it, then tweak for bigger batches to your preferences. How does this feel on the skin? When I first tried this recipe and applied it to my skin, I thought, Oh know, this feels oily. But within a few moments, the oily-feel disappeared and my skin just felt really soft, well moisturized and simply luxurious. 🙂 Even my husband, who hates the feel of lotion/body butter on his skin, likes how this feels on his rough hands. Substitutions: You can always swap out one of the butters to something you prefer such as mango butter. You could also just leave one of the butters out and double up on the other. Measurements: I have provided measurements by weight instead of volume because I find it to be easier and more precise. But if you don’t have a digital food scale (which I love having and use almost everyday), you can use measuring cups. 2 ounces is approximately 1/4 cup. The ratios are simple enough as you can see below – just use equal amounts of each ingredient (aside from the essential oil). 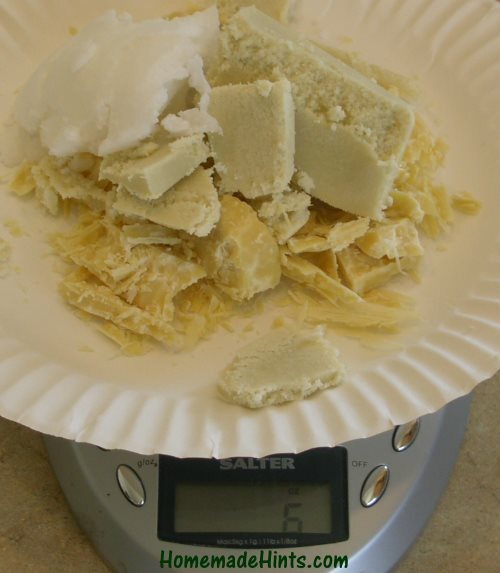 Here is the cocoa, coconut and shea butters measuring a total of 6 ounces. A scale isn’t necessary, but it makes it easier. 2 oz Sweet Almond Oil – I like the feel and aroma of almond oil, but you can use any other light carrier oil such as hazelnut, jojoba, rosehip, etc. 5-15 drops of your favorite essential oil (optional). I’ve used peppermint, lavender and sweet orange – not all at once, but individually for each batch. 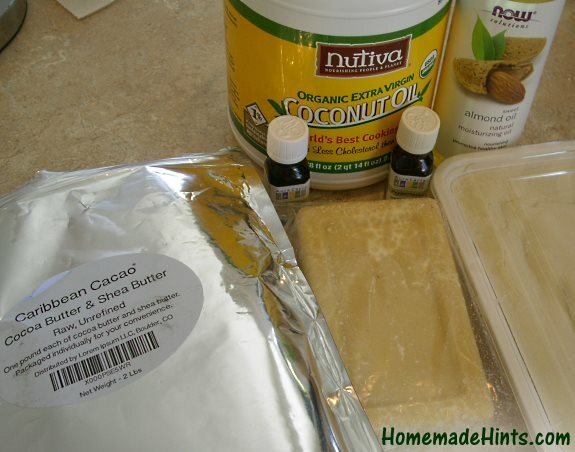 I purchased the cocoa and shea butter in blocks and then just broke or shaved enough off for the recipe. 1. Place all ingredients (except the essential oil) in a small pot/saucepan and warm over low heat, stirring until just melted. 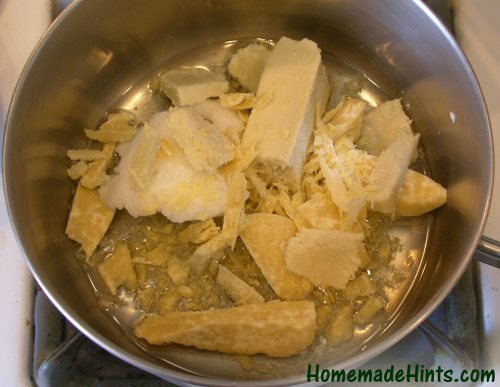 Melt the butters, coconut and almond oil over low heat until just melted. 2. Remove from heat and allow to cool for a few minutes. 3. 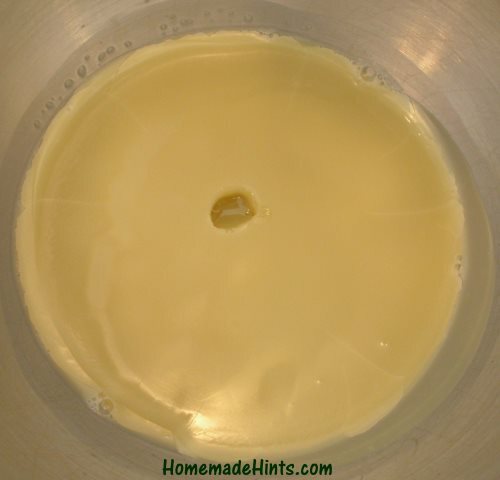 Pour the mixture into your stand mixer bowl (or any other bowl if you will be using a hand mixer) in the refrigerator until the mixture slightly hardens, about an hour or two. I’ve also put it in the freezer to speed up the process – just don’t let it sit too long. You want it slightly hard, not frozen! But no worries, if this happens, just allow it to thaw at room temperature before whipping. This is an important step. If the mixture is not cooled, it won’t whip properly. See photo below. 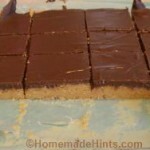 Refrigerate or freeze the melted mixture until slightly hardened. It will still be soft enough to make a dent with your finger. 4. 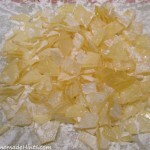 Add your essential oils (if using) and whip with a stand or hand mixer until stiff peaks form. Whip with a stand or hand mixer until stiff peaks form. 5. Place your whipped body butter in a container. I just use a mason jar, but any wide-mouth container will do. Leave it out or in the fridge: You can leave your body butter out at room temperature, unless it gets above 75 deg F. Temperatures above that will make the body butter rather soft, so you may want to keep it in the refrigerator. If you body butter does ever melt, you can always re-whip it. And there you have it! All-natural whipped body butter that your skin will love with no weird chemical ingredients that you can’t pronounce. Enjoy! Here is a useful butter comparison chart for skin if you ever want to swap out different butters in this recipe. P.S.S. 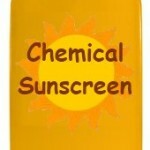 You can also use this as a base for making a sunscreen. 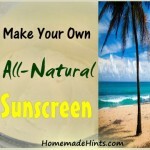 Here are two natural sunscreen recipes that are simple and without any hormone-disrupting, toxic chemicals. Does it smell like cocoa? I’ve heard comments that cocoa butter can do that. Cynthia – If it was primarily cocoa butter, yes, but since there are other aromas coming from the addition of shea butter, coconut oil, almond oil, plus any essential oils that may be added, personally I don’t think it smells like cocoa.